F Every year on Max Nicholson's birthday, 12 July, a group of us walk a section of the London Jubilee Walkway to celebrate his work in originating it. Some pictures from "WWF - a biography" - an exhibition in 2011 in Zurich celebrating the first 50 years of the World Wildlife Fund. This website is a growing memorial to Max, built up by the kind recollections of many of those who knew him. There are now links to the latest additions to this extensive page. If you would like to contribute a recollection or anecdote, please send it to Piers Nicholson . As you will see from the recollection page, all kinds of recollection - formal or informal, official or personal - are very welcome, and will help tobuild up a picture of Max's complex and interesting character. "Max Nicholson was a giant in his time, with a compelling combination of idealism, imagination, energy, and managerial ability to put his ideas into practical effect." If you would like to give a donation in Max's memory, here are some suggestions with a Gift Aid certificate to increase the value of your gift. 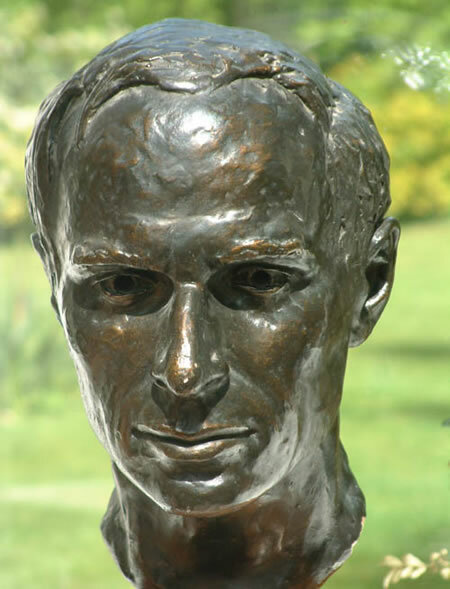 This bronze head of Max was sculpted by Alan Jarvis in 1950.